How many octogenarians do you know? Not many, I bet; however you probably know more than your grandparents did. Overall, people are living longer and maintaining a more active lifestyle than previous generations. A fine example of there being life after eighty is Burnsie Lawrence of St. Jacques. This spring she crossed the threshold of having lived for eighty years in St. Jacques, the town in which she was born. With that distinction she joins approximately 117,000 other octogenarians in Canada. In addition to other qualities this milestone places her in some unique company. Born in that same year were country singer Willie Nelson and comedienne Carol Burnett. It was a Thursday when she breathed for the first time the salt scented breeze that finds its way in from Fortune Bay. That was one year before Newfoundland lost its independence to Commission of Government, six years before the outbreak of World War II, fifteen years before she left school and twenty years before she would marry J. Thomas Lawrence. If you ask Emma Amelia Burns Lawrence (Skinner) why she is so uniquely called “Burnsie” she will be delighted to tell you the story of how she was named for a nurse, Amelia Burns, who was working with the local doctor, Dr. Conrad Fitz-Gerald who assisted with her birth. Amelia Burns was a relative of Keturah Fitz-Gerald (Partridge), wife of Dr. Fitz-Gerald. Amelia was born on Saturday, February 17, 1872 in Cape Breton. She married Samuel Drake Burns with whom she had two children; Gladys Anna and George Richard. It was some time after her husband died in 1924 that she came to Newfoundland to work in Fortune Bay as a nurse. Amelia Burns passed away on November 9th 1955 in North Sydney, Cape Breton, Nova Scotia. Her first name Amelia has now been around for one hundred and forty one years and her married name Burns for approximately one hundred and thirteen years. [Ancestra.ca] The next time you speak to Burnsie you’ll remember Nurse Amelia Burns. Read about Burnsie’s experiences growing up in St. Jacques and her involvement in the community in this article, Memories of St. Jacques, by Clayton Hunt of The Coaster which was carried by The Weekend Telegram on August 30, 2008. In that article you will read about why she left school in grade 10, how she first worked as a domestic servant, then a store clerk and how she met her future husband and the unique experience that marriage brought to her life. Visit Burnsie at her home in St. Jacques and you will notice a Captain’s hat displayed prominently in her living room. Ask and you will hear of the love of her life; a man who first went to sea as a teenage deckhand on sailing schooners to the Grand Banks and rose to captain of a variety of trawlers fishing out of Hr. Breton. At the end of his career he was ‘Skipper’ on the Zweelo, a state-of-the art stern trawler owned by Fishery Products. Captain Tom Lawrence was a high liner fisherman and a well-respected member of his home community. His untimely death in 1987 at age fifty-seven was a family tragedy and a significant loss to the community. NLAC: What was accepting the award in Gander like for you with your mom being there? Ruth Lawrence: It was a wonderful moment; late that afternoon my sister Hazel sent me a text saying that she was on her way from St. Jacques. I remember saying to Des (Walsh), what if Mom is with her? I was a little unnerved, I wasn’t expecting to win. But when they said my name, she leapt to her feet beside me. When I was in my early 20’s she observed, “I don’t know what happened to you; you don’t have any pride.” She was referring to my distinctive wardrobe, as I recall. But, I disproved her completely that night. She’s 79 so I was pretty proud to have her with me. Burnsie Lawrence really is a remarkable woman. She taught me about community, there’s no doubt. I was happy to share that moment of pride. 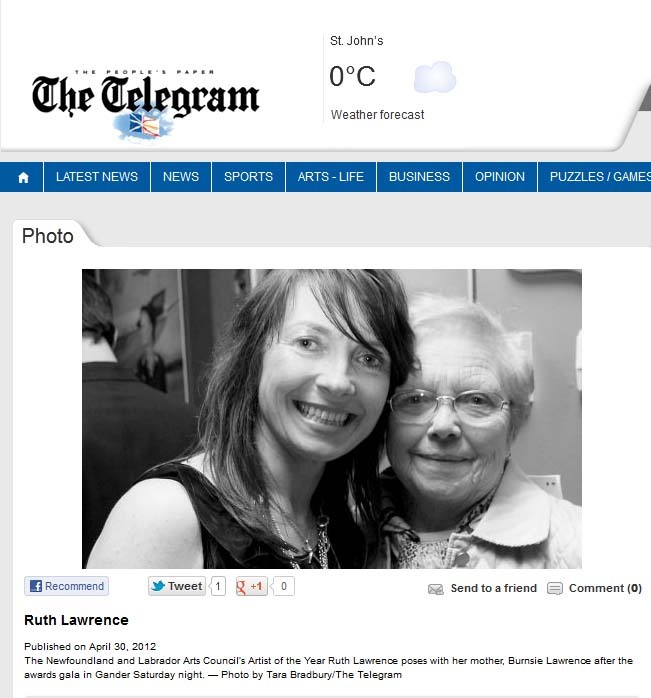 You can read the entire interview on the Newfoundland and Labrador Arts Council Web Site During her acceptance speech at the Arts Awards Ruth commented that a great deal of her mother shows up in her acting and film work whether her mother is aware of it or not. The town of St. Jacques was no stranger to The Great Depression of the 1930’s into which Burnsie was born. Living conditions were determined by resources at hand and opportunity to earn income. People who lived through that event tend to have a deep appreciation for how tough and challenging life can be at times. Burnsie is certainly one of these. She has risen to whatever challenges have come her way throughout her eighty years and today can look back on a family whose members have touched all continents of this earth. She can look out the window and see her hills of home and reflect in those quiet moments on all those people who have passed through her life and also called these hills home. 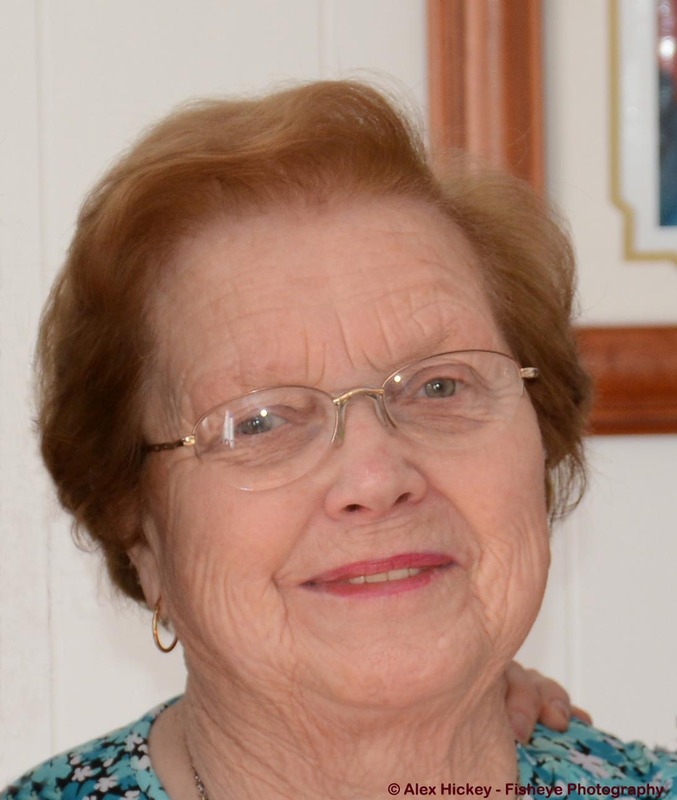 In celebrating this new octogenarian, this eightieth birthday, we celebrate her life, our life and the lives of all around us. We celebrate the existence of human kind and its uniqueness on this planet while focusing on the single person who has reached this milestone – Emma Amelia Burns Lawrence. What a great article Uncle Alex. I randomly found this online but so glad I did. Can I ask, is the picture of the little girl a photo of Nan, I believe it is but want to be sure. Is there any way I can obtain a print version, or do you mind me to print out? Well Alex, your article about Burnsie and the one about St. Jacques both made me cry and long to see St. Jacques again. I was so sorry to hear from Ray that Burnsie has had a serious fall. I really pray that she will get back to her old self soon. Your writing is truly beautiful. God bless. Marina (Pope) Dawe-MacDonald.